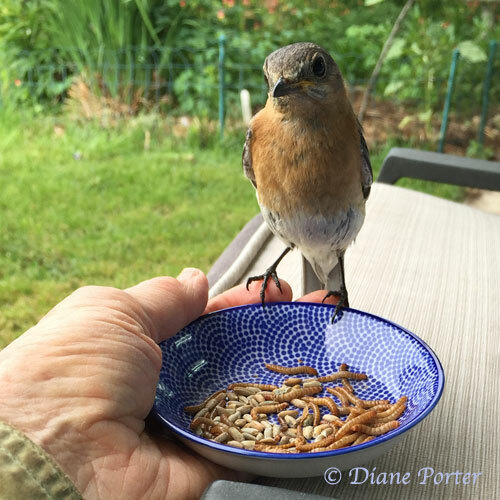 The female Eastern Bluebird (whom I call Lady Elizabeth) trusts me a bit more each day. She and her mate (Sir Lawrence) fledged five babies from the nest box in the garden on Monday. The parents continue to deliver meals to the youngsters up in trees' thick foliage. I like helping, in my way. 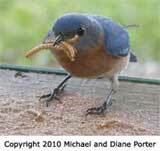 I like slowly convincing the bluebirds that I'm not scary. I like the feeling of calm, friendliness, and patience that our interaction brings up into my soul.